It was the first area to raise the Lebanese flag after gaining independence from France. 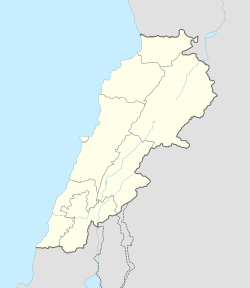 Bchamoun’s name is derived from “Beit Chamoun” (Arabic) - Neither the word beit or the word chamoun are Arabic although there is a word beit in Arabic but this one is not. The word comes from Syriac Aramaic spoken by the Canaanites. , “House of Chamoun” (English), "Temple of Eshmun" (Syriac Aramaic), a Phoenician god. Bchamoun has 9 schools, 2 public and 7 private. There is only one hospital in Bchamoun which is Bchamoun Speciality Hospital. An archaeological site was discovered 6 kilometres (3.7 mi) east of Khalde by V. Hankey in 1963. The site is located on the western terraces of a conical hill, west of the main village called Qalaa' Tahun-el-Haoua. An unpublished collection was also made by R. Saidah. Various potsherds were found and dated back to the Early Bronze Age by Maurice Dunand. Amongst the pottery was a sherd with a cylinder seal showing pattern of marching and alternating goats and lions that was similar to sherds showing a similar type of animalism from Byblos, Megiddo and other Palestinian and Syrian sites dating to the EB period. Although some thinner pink ware was found, sherds were usually red or grey, thick and well fired. The forms suggested were large, flat based jars with flared rims. Decorations found included incised patterns, made with combs to form bands of chevrons. Similar finds were discovered at Jaita I, Kaffer Jarra Roueisse, Nahr Damour, Aramoun and Khallet-el-Khazen. Two used flint blades were found along with part of a basalt object. ^ Lorraine Copeland; P. Wescombe (1965). Inventory of Stone-Age sites in Lebanon, p. 72. Imprimerie Catholique. Retrieved 21 July 2011.